Our team is always looking to add riders. Occasionally, riders “age out” or find other sports to keep them busy. On this page, we’re showing the most current roster of our Junior Cycling Team. 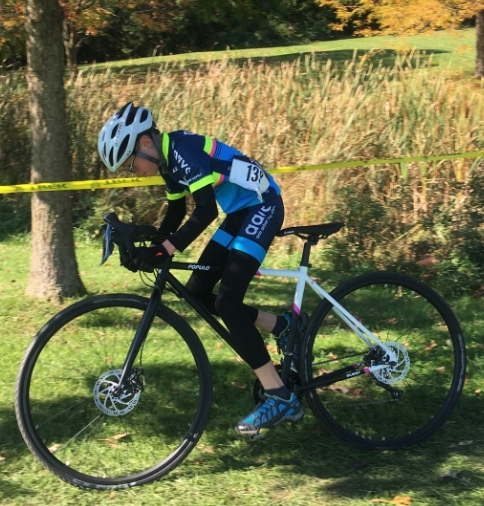 Aidan has raced with the juniors from the start of the 2018 season. 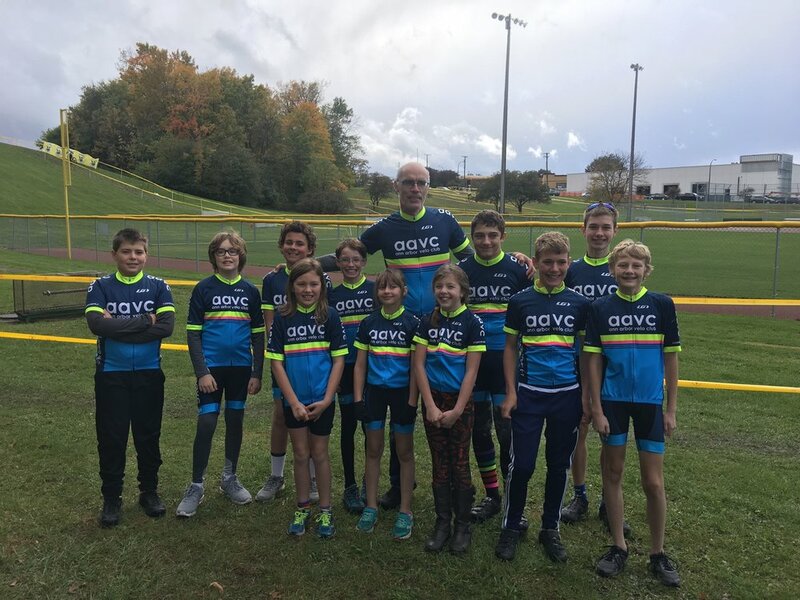 He focuses on the local races, but he's also scored a podium Ohio's Sylvania Classic and can be seen training every week at the Lexus Velodrome. This will be one of the last time you'll see him on his Diamondback, though; he's about to outgrow it. Alex joined the Club just in time for the 2018 cyclocross season. He's raced at Alma and Island Lake, steadily improving. He likes that cross is not for sissies. You can easily recognize him by his bike's classic green Michelin tires. Ansel "coach's son" de Jong is in his second season of racing. Vets Park 2017 was his first ever race. This year, his 22 races competes with Connell's total for the Must Race Hard Award, the prize for the most prolific racer of the season. His races include trips to Ohio, Wisconsin, and Florida. He is proud of the flash of pink on his new bike. Charlie is one of our most recent recruits and Vets Park 2018 was his first ever race! It's all so new to him that he hasn't even decided yet what bike to ride; his Giant road bike with blue bar tape, or his mountain bike with yellow rims. He's tried out practically everyone else's bike, so who knows what he'll be riding when you next see him. Even at the age of 12, Connell is already the team's veteran: this is his third year of racing. His 22 races include Road Nationals in Maryland and World Cup CX in Wisconsin and several races on the Lexus and Bloomer velodromes. He is racing the club's other loaner bike. Although the junior club has a few siblings, Fiona and Aidan are the only siblings regularly racing each other. 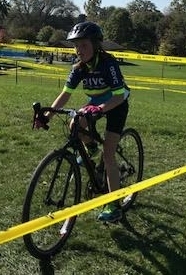 Fiona's first race was at Alma 2018. She has been in heated battles with Juniper Phillips Carpenter, including an agonizing defeat at Montibeller Fire Mayhem 2018 -- that race was one lap too long for Fiona. They are on similar-looking Trek bikes, but Fiona has the white saddle and red bar tape. 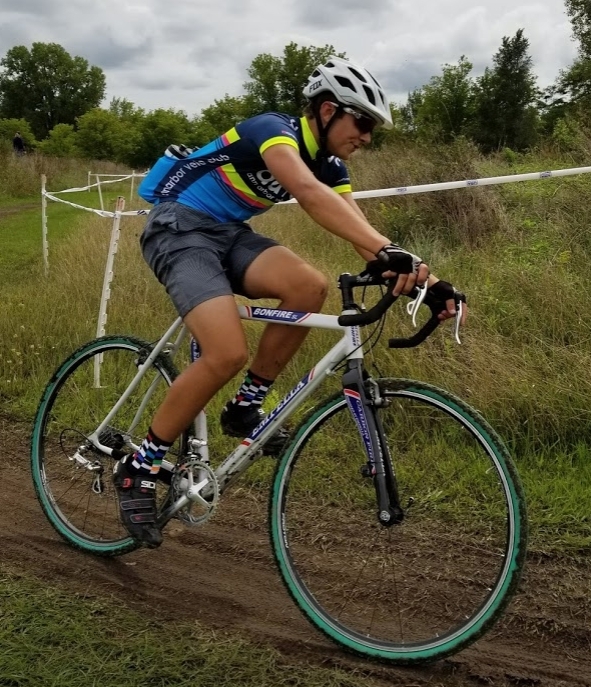 Gus joined the 2018 team just in time to sneak in a road race (the Strade Bianche), then followed up with strong performances the Beer City and Montibeller CX races. He even beat his own mother in Beer City. His brand-new Colnago is arguably the prettiest bike on the team. Joseph first rode with the club in the fall of 2017, but he didn't race until Montibeller Fire Mayhem 201. He's racing on one of the club's loaner bikes, green and orange; one of just a few riders who's not clipless yet. Montibeller Fire Mayhem 2018 was just Juniper's first ever race, and she ended up on the podium! Third out of seven, faster than some of the boys. She can often be seen racing closely behind or in front of Fiona Lafferty. Juni is the one with the black -- helmet, bar tape, and seat. Katie joined the Club just so she could race Vets Park 2018! Never raced before, practiced once, we don't even have a picture yet, and she took the victory! She is part of our group of little lady racers that has formed this fall. They're all 10 or about to turn 10 or their racing age is 10... I call them the 10-year-olds. Give them an extra cheer for doing their part to bunnyhop the patriarchy. Katie races a neon green Giant TCX. Dominic came to Vets Park 2018 to race, finished third, and promptly decided to join the Club. He rides a dark blue Diamondback. Welcome, Dominic!